Home » The Unruly Ascetic » Welcome, Madame. This will be my first attempt at bogging on an iPad mini. Thus far it is a success. I fear that I will have to abandon my fondness for emotional capitalization (or lack of capitalization) with the autocorrect that remains necessary as I get used to this tiny, touch sensitive key board. I arrived a week or so ago to Mysore, eager to practice and see some much missed faces. And when the most-missed face looked at me like a nutter and said “no, not possible” to my request to practice for one week, I promptly decided to abandon all the missed faced and bugger off to Hampi for a bit of a preemptive holiday. 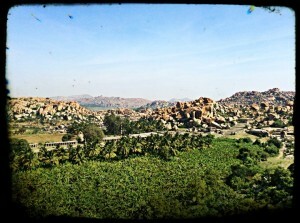 As it turns out, Hampi is lovely. Covered in cool rocks and hippie cafes, I am glad for the motivation and the opportunity to get my traveling feet a bit wet, since going to Mysore feels more like going home than like traveling these days. This weekend I head to Purple Valley. I can not express how happy I am about it, visiting my most beloved Mel, getting a new teaching experience, and experiencing Goa for Christmas and New Years. I have just been informed that Asia’s biggest electronic music festival will be taking place just before the new year, maybe I’ll hit it up on my night off.